I had prepared for my first overnight bicycle camping trip for months. My brainstorming began in January when I first heard one was being organized. I started researching equipment in February; then I began to gather equipment and supplies in March. 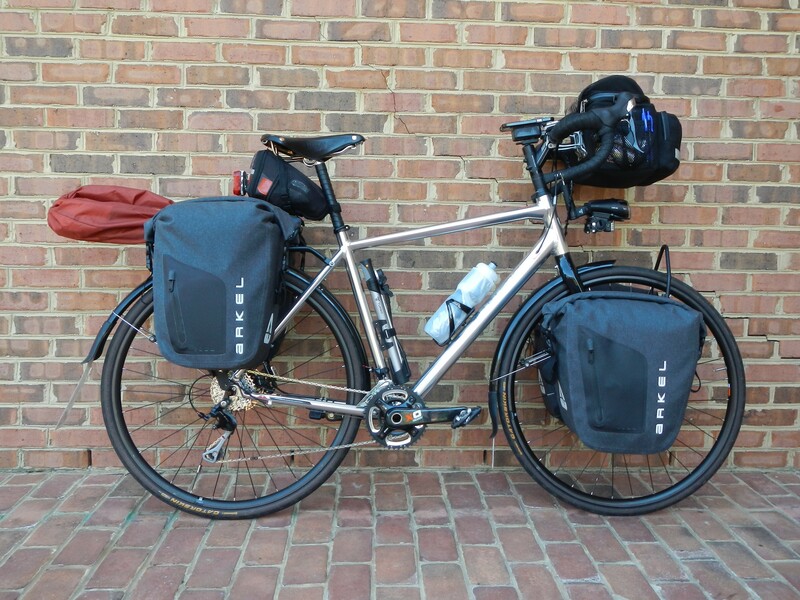 If you’ve read my Bags & Gizmos page, then you already know I favor Arkel touring products. It was a cool coincidence that Arkel had just released their new Orca waterproof panniers when I was ready to shop. They feature roll-top closures and are very durable. I opted to buy a full set, which includes a large 45-liter pair for the rear and a 35-liter pair for the front. I ordered Arkel’s AC LowRider front rack, too. I quickly loaded the panniers with notional camping gear and took a fully-loaded ride and experienced some handlebar shimmy. I reoriented the rear rack and the ride improved, but only a little. I also swapped the rear panniers to the front and got an even better ride. The photo above shows that it didn’t look too odd since the Orcas are fairly large, anyway. I’ve read that many things contribute to handlebar shimmy on loaded bicycles. Some causes include having the rear rack too far rearward as well as load balance. My feet are large, so I cannot bring the rear panniers too far forward or my heels will strike them, even with 43.5-mm chainstays. I think my aluminum frame could be another driver. Some say that any frame can develop a resonance if the load is just right (or just wrong). I wonder if a steel frame does a better job at dissipating the resonance before it becomes an oscillation at the handlebar. I speculate that my aluminum frame was transmitting the rear end resonance to a front end shimmy. I’m no mechanical engineer, but my theory is a fiction I can live with. My rear rack may have been suspect, too. 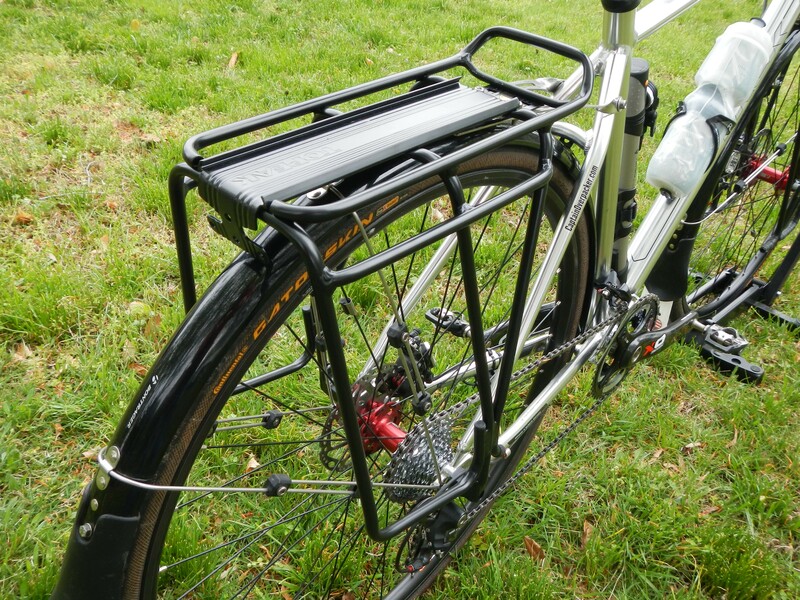 I purchased a different rack, one that features a third vertical support and a separate, lower bar for the panniers (shown above). My hope is that the extra bracing will form a more-sturdy rack and that the lower pannier mounting might lower the load’s center of gravity. I didn’t get a chance to test it before the tour (or up to this point). So far, my testing showed that the very best, and most stable, ride on this bike came when I rode with only front panniers. I first saw a front-only setup when I watched “Melons, Trucks & Angry Dogs: Going AWOL on the Transcontinental Race” on YouTube. The riders explained their front-only setups and addressed stability in one of the four episodes. I also searched for front-only setups at BikeForums.net and read some good comments. Armed with the pros and cons, I decided that front-only was the way I’d ride for an overnighter. The bike handled great! With the weight in front, under the handlebars and down low, standing up to stretch or to blast over a short climb was surprisingly easy. That’s not to suggest that the bike’s handling was swift. NOTHING was happening quickly with nearly 40 lbs hanging from the front of the bike (split between the panniers, handlebar bag and headlights). However, the bike was stable and easy to ride. 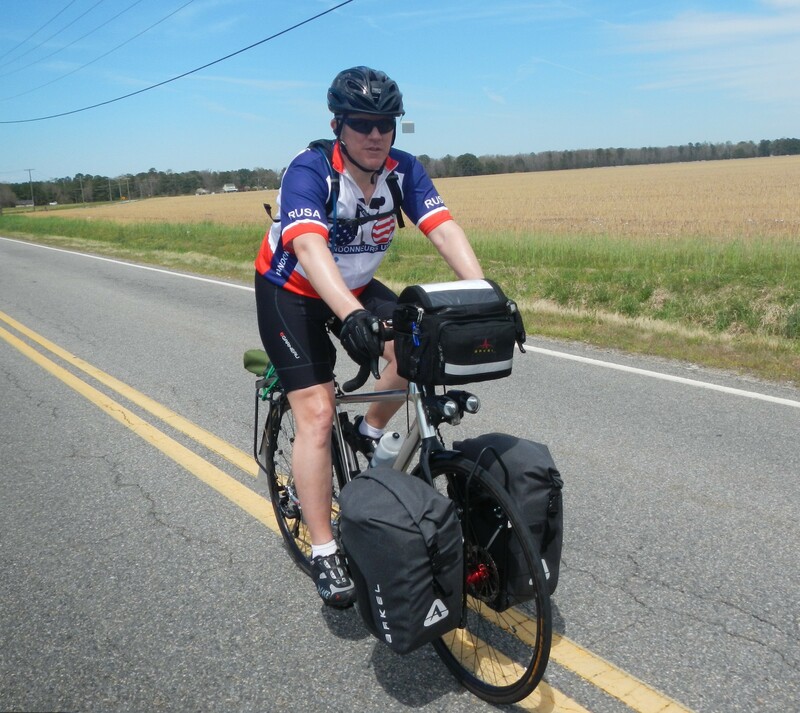 Panniers – a two-person tent, sleeping bag, sleeping pad, a pillow, toiletries/meds, a change of cycling clothes, clothes for sitting around the camp fire, and bungee cords. I did not pack shoes, sandals, a towel or wash cloth, or soap/shampoo. Instead, I packed an 8-pack of 8×8″ bathing wipes and decided to see if I could stand “roughing it” for an overnight. That’s enough about my setup. I’ll share a ride report from the overnighter on Friday. I recently purchased the Arkel Orca 35s for use with my Topeak Super Tourist DX rack, the same one you appear to be using. However, I found that while the cam-locks work, the hook hangs too long (below the bottom of the rack) and will not hook securely. Did you have the same problem? May I ask how you overcame this problem? You present an interesting problem. I’d contact Arkel directly and ask them. They’re very responsive. Regarding the Arkel hook, you can tie new knots in the bungee to shorten it.